Gay-Lussac was educated at home until his father was arrested during the French Revolution. In 1797 he entered the École Polytechnique in Paris and after attending the École des Ponts et Chaussées he became assistant to Berthollet. Together with his friend and fellow scientist Alexander von Humboldt he discovered in 1805 that the basic composition of the atmosphere does not change with decreasing pressure. In 1808 he was appointed professor of physics at the Srobonne, a post he held until 1832. In 1809 he announced the law of combining volumes of gasses that bears his name. In the same year he married Geneviève-Marie-Joseph Rojot, whom he had met when she worked as a shop assistant and studied a chemistry book under the counter. In 1831 he was elected in the chamber of deputies, representing Haute-Vienne. In 1839 he became a member of the senate. 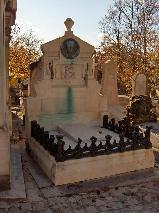 The grave of Joseph Louis Gay-Lussac at Père Lachaise, Paris.